If you are moving to a suburb outside a metro area or if you wish to keep the boxes for longer than 3 months then it is cheaper for you to buy boxes as opposed to hiring them. For lighter, bulkier items - pots, pans, clothes, toys, linen, cushions, shoes etc. Filling large boxes with heavy items will make them heavy and awkward to move and carry. Think of the removalists and yourself for packing and unpacking! For packing heavier items such as books, papers, records, CD's, DVD's. Crockery and glassware travel extremely well in this box. Wine bottles, pantry, bathroom and sink cupboard items, tools etc. Also known as book/glassware box. Crockery and glassware pack very well in this box as there is less weight pushing down on items in the bottom of the box than packing them in a larger box. Don’t risk damage to your best dresses, suits and shirts. Protect them with our convenient portable wardrobe boxes. They include a metal rail to hang your clothes directly from your cupboard and mean it not only saves you a lot of time with the packing and unpacking, but also ensure your best clothes don’t get ruined during the move. Our tape dispensers not making taping up the boxes fast and stress-free. People typically don't realise just how long it takes to tape a bunch of boxes (along with cutting the tape) takes without using a dispenser. Save time and hassle using our extra strong tape dispensers - and the beautiful part of it all is that you can hire one for only $8. Extra strong packaging tape. One roll will seal approximately 20 boxes. It is important to use the correct type of tape to ensure the boxes do not become unstuck during transport. Our white wrapping paper is ideal to protect your crockery, glassware and delicate items to ensure nothing breaks during transport. Unlike newspaper, our paper won’t stain your items and is manufactured specifically for wrapping delicate items. It can also be used as a filler in boxes to avoid items moving around. This comes in a 15 metre roll and is 75cm high. It is perfect for protecting items such as pictures, vases, ornaments and precious items that need special care and attention. TV's and computer monitors can also be protected using bubblewrap. Our bubble wrap is specifically cut to 75cm high to ensure it covers most items, normally bubble wrap is only cut to 50cm high. -> Protection from dirt,dust & water damage. -> Stick them on the packaging tape to identify sensitive items in the boxes. -> Conveniently packaged into plastic pack of 20 for your use. The permanent marking pen is used for writing on the tape to indicate to yourself and the removalist what is in the box. 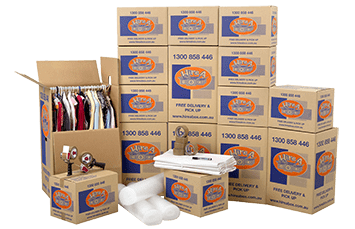 Delivery is free when you hire packing boxes or tape dispensers to the value of $65.00 inc. GST or over. For orders under $30 the delivery fee is capped at $35. For orders above $30 the delivery fee is the difference between $65 and the value of the hire items. Hire A Box operates in the metro areas of Sydney, Brisbane, Melbourne, Adelaide, Perth and the Gold Coast. To check if we service your area please enter your postcode(s) below. If the area you are moving to is outside our serviceable area, then you can buy boxes from us but not hire them. Thank you for your enquiry we're sorry we can't service you. Thank you for your enquiry. We're sorry we don't service your postcode at this time. If no one is going to be at the premises at time of delivery, please note where to leave the goods in the field provided below. Please note as per Hire A Box Terms and Conditions, the customer is solely liable for any loss or damage incurred under these circumstances. Lift or stairs? How many flights? Parking availability for truck? Heavy items such as pool tables or pianos? Steep driveway? Any Additional locations? Number of workstations? would you like packed, etc? Complete your order by paying with your VISA or MASTERCARD only. By clicking the "Process Payment" button below, you are agreeing that you have read and understood the Hire A Box Terms and Conditions. Click the "PROCESS PAYMENT" button ONCE ONLY and then please wait. Processing time may take up to 60 seconds. ** eWay's secure server software (SSL) is the industry standard and among the best software available today for secure commerce transactions. It encrypts all of your personal information, including credit card number, name, and address, so that it cannot be read as the information travels over the Internet. All boxes supplied by Hire A Box will be usable when delivered.The quality of boxes allows them to be re-used a number of times. Note that the boxes may be kept up to a period of 3 months from the day of delivery. There will no refund and the boxes will not be collected after this 3 month period. To arrange collection of your hired items this must be done online here hire returns page or by sending an email prior to the 3 months expiry time. *Free delivery requires a minimum order. Before you can place your order, you must enter QTY values for items above.